Here comes excellent news for residents of London, who are suffering from acute hair loss problem. Now you can easily avail right sort of hair loss treatment and therapy in London to get rid of this health issue on permanent basis. From our various treatment packages, we will provide you the one, which is meant for you exclusively. Hair loss is a very common condition that just not only affects the scalp but sometimes the entire body. There are several causes of hair loss such as hormonal changes, medications, heredity or medical conditions. Men, women and children anyone can experience hair loss. Hair fall leads to total or partial baldness that is a serious matter and must be attended instantly. An average adult head has about 150,000 to 100,000 hairs and loses up to 100 of them a day. However, abnormal hair loss can happen in a number of ways where you may notice dramatic clumps falling out or hair may thin slowly over time. Physical stress such as car accident, severe illness, surgery, etc. Who does not want to have healthy and bouncy hair? unturned to look attractive in everyone’s eyes. Hence, you overlook the side effects of cosmetics and use harsh chemicals on your skin and hair. As a result, you get to see the side effects of hair loss in no time. If you are a victim of hair loss and finding out a permanent solution for your hair-related hassles, you need to get the best treatments from reputed hair clinics in London. Seek help of the hair loss treatments in London to get the desired result in a few months. The treatments used for hair loss are certain to give you a long-lasting result. The highly effective treatment programs are tailored with the person’s hair loss conditions. Depending on the problem of the hair loss, the right treatments are provided to each person. With the help of unique products and right consultation, you can get your bouncy hair back in your life. Also, the various treatment packages will prove to be beneficial for you. Before your hair starts shedding, you must obtain expert treatments of hair loss to keep you pretty forever. A wide range of hair loss products is available which is clinically proven and approved by FDA. Men and women who are the constant sufferers of hair loss should make use of the products as soon as possible. By the proactive use of the aftercare treatment options catered for men and women, you can be sure of stating away from the problems of hair loss. The aftercare includes clinical monitoring, constant check-ups, quality hair products, medications and sundry effective hair loss treatments will sure to grow your hair all over again, giving you a guaranteed result. Get your hair properly treated from the recognized doctors, surgeons and specialists who have years of experience in giving fruitful results to the patients dealing with hair loss. Either you have to visit the doctors in-person in the London centers to solve your hair-related issues or you can fill up an on-line consultation form where doctors will give you an ever-lasting home remedy for your hair loss. Depending on the reasons of your hair fall, the proficient surgeons will carry out the surgery which will increase the density of hair in the near future. The medical practitioners will identify the reasons connected to your hair fall and will give you top-rated solutions, protecting you from more hair loss in future. There are several people who were once dealing with the problem of hair loss. After getting the medications and treatments, they found a considerable change in their hair growth. People who received treatments are happy with the positive results. Women who lost confidence because of the continuous hair loss, they have observed a huge change in the health of their hair. Hence, they highly recommend others to get the immediate hair loss treatments as quickly as possible. Situated in the centre of London’s medical area, our modern, Harley Street clinic is the ideal environment to discuss and plan your treatment needs. Our London clinic also houses our purpose built hair transplant surgery so your full procedure can be performed in this state of the art environment. The clinic is just a short walk away from Bond Street and Oxford Circus tube stations making us easily accessible. Nu is proud of the clinical expertise and client services that we offer. The clinic manager, Chloe, has worked in the cosmetic industry for over 5 years and has extensive knowledge in hair loss procedures. At Nu Hair Clinic London, you can access the best free consultations with expert surgeons to ensure you have all the information you require to make the decision that’s right for you. 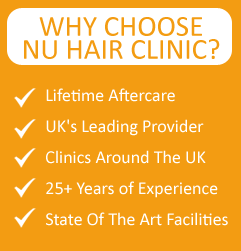 Nu Hair Clinic in London has emerged as the ultimate solution provider for all hair related problems. Our free consultation services give confidence to the patients about the surgical and non-surgical methods of hair treatments. Our team is well equipped with extensive technical knowledge and customer handling capacity and thus we are the leading hair treatment clinic in London. Chloe, the Clinic Manager here has over 5 years of experience in the cosmetic industry that has given him the potential to run the clinic here so efficiently. He has deep knowledge about all kinds of hair treatment processes. With us, hair transplant for men and women in London & other cities in the nation has become much accepted in London because of the ease with which we accomplish the task. We give the most customized solutions depending on the exact problems of the customer rather that suggesting generalized treatment patterns. Our surgeons take the pain of having sittings with the patient before the surgery to prepare them for the treatment. The post surgical care is also maintained very speculatively so that the patient gets the best results. For problems on hair thinning and baldness, the most popular treatment procedures in our clinic is the Follicular Unit Extraction (FUE). The surgeons pick up unit hair follicles from the hairy regions of the scalp or body and graft them in the empty areas of the scalp. The actual results are visible only after 9-12 months of the surgery after the newly planted hair follicles are surrounded by the adjacent scalp tissues. Facial hair transplant and eyebrow restoration are the other two most significant surgical treatments that we offer. Our non-surgical hair treatments also give miraculous results. The Platelet rich plasma therapy and also the Mesotherapy work wonders to make the scalp fertile for promoting hair growth.